I consider that an intelligence issue. again on the real biker scale. trikes? Are they real bikers? Can a Gold Winger ever become a real biker? It was the first day of the homecoming, which allows riders to reunite and celebrate the history of their bikes at their place of origin. The event is expected to draw 8,000 to 10,000 people before it ends Saturday. Since the plant announced that motorcycle production will cease in June 2009, homecoming planners have been preparing to go out in style. Like many, today I’m watching the Indy 500. It’s amazing to think that the company that built most of the engines powering today’s race was born so many years ago in Japan. In 1949 Soichiro Honda had a dream, a dream about a motorcycle. Many youngsters driving all those Accords & Civics today don’t even realize that, if it weren’t for these first motorcycles, the Honda car company wouldn’t even be here. Just a little something to think about. 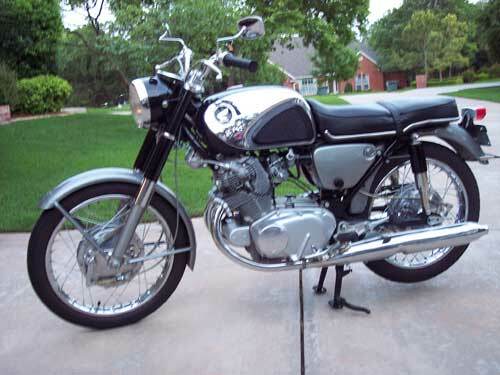 Here’s something like the Honda that got me started back in 1969 – a 1965 305 Honda Super Hawk. Many think this was the “300 Dream” but it’s not. The Dream had a welded steel unibody, no frame. The Super Hawk (and it’s brother, the 250 Scrambler) had regular steel pipe frames.